This is a little name tag I sewed for last weekend's Sew It Together. I put it together for a lovely lady called Apple and Tangerine, who also goes by the assumed name of Tanya. 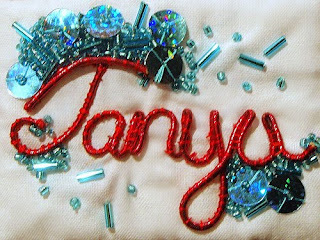 I couched the shiny red name on a piece of stabilised white quilting cotton and then sewed clusters of seed and bugle beads and sequins into the background. Well I can't comment on the artistic vision unrealised, but the actuality is pretty good. This may seem like faint praise, but I don't like bling/shiny/pearly/glittery anything, so really it's my equivalent of a superlative for a beaded item. Me, I'd have probably spelled the name wrong and had to stay up til stupid o'clock fixing it. Ooooh I love a bit of bling, so this is right up my alley! I wish I'd had been a little more observant when chatting to Tanya on Saturday. I think it is georgeous! Beautiful work as far as I am concerned! Oh the bling factor is just perfect! Thank goodness for those sausage fingers.